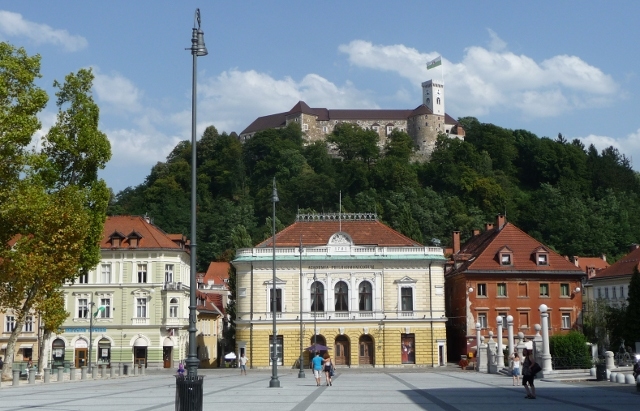 Ljubljana is a city that invites visitors to linger. It’s a small scale city compared to other European capitals, with a population of only 280,000 (the whole country only has two million inhabitants). It’s young at heart while preserving its history and elegance. 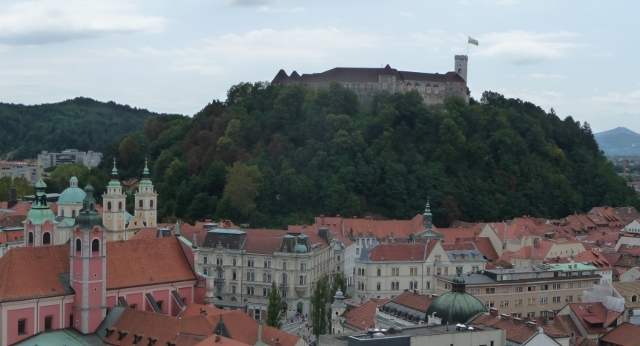 It was founded, so the legend goes, by Jason, the Greek hero with the Argonauts, who sailed up the Ljubljanica river with his stolen golden fleece, making a stop in marshes near where the city now lies. There was of course a monster there to fight – a dragon who was despatched by Jason only to become the city’s emblem for ever after. 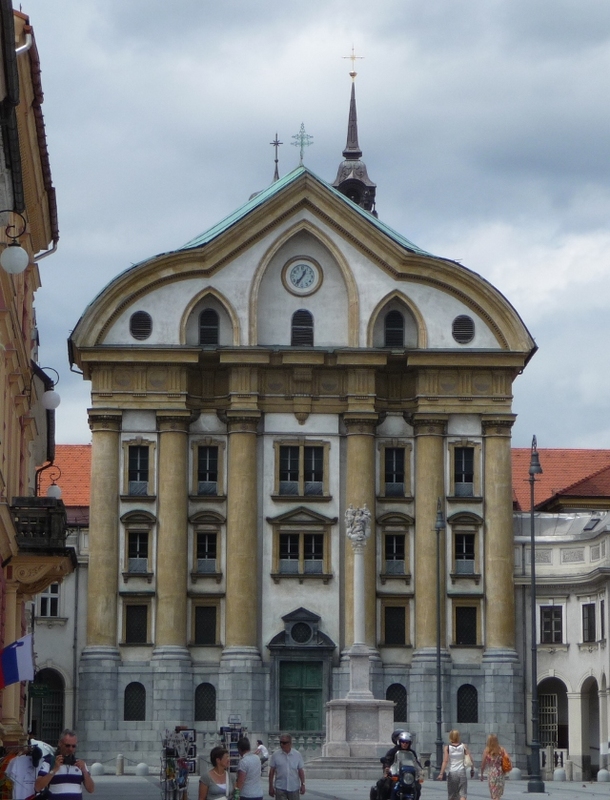 We’d spent a few days in and around Ljubljana staying with Peter and Alenka in their suburb of Polje. Now we lingered savouring the relaxed atmosphere, really loving the city. We planned to cook a big meal to say thank you to our hosts and after shopping at the local supermarket, took off into town on our bikes. There is a network of cycle paths, pavement cycling is tolerated, and drivers generally seem more cyclist aware than in many of the countries we’ve been to. 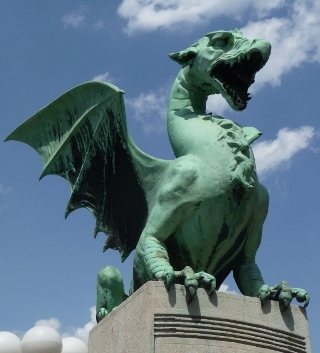 Ljubljana is on a plain, so in true Olympic-inspired spirit we fair sped into the old part of town, leaving our bikes by a dragon-adorned bridge. We wandered through the market area, and as it was late lunchtime we were starting to get peckish. We stopped at a pavement table outside one of the several tea boutiques, and had an omelette and sandwich washed down with homemade lemonade and an iced fruit tea with orange juice, which looked not unlike a Tequila Sunrise. Refreshed, we hit the walking tour in our tourist guide, and explored the old streets, tranquilly basking in the hot sun. The river passing gently beneath a series of bridges, you could walk alongside it on either side. Yellows and pinks of churches and old buildings of the Hapsburg era, more enticing cafés and some very tempting small shops. Across the river, we saw a signboard telling of a letterpress printer, and walked up the cobbled side street to take a closer look. 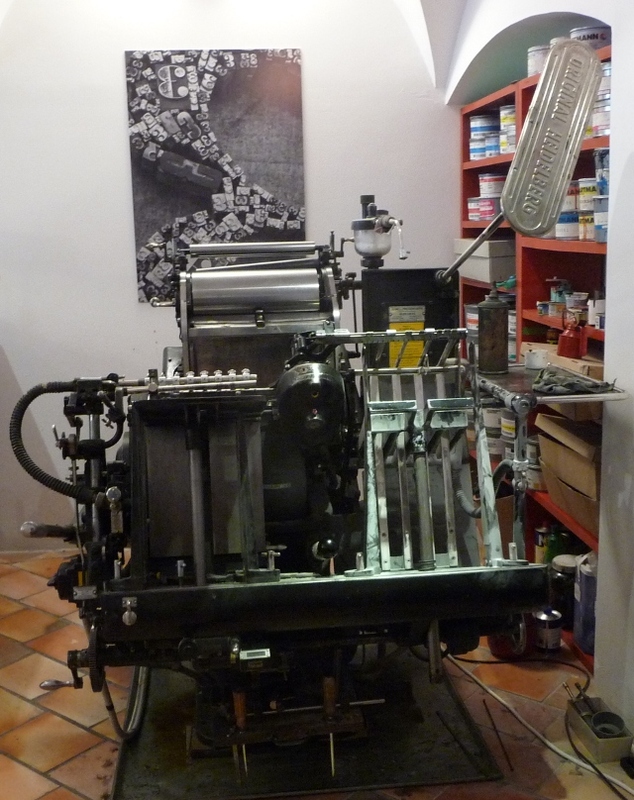 Inside the small walk-in studio, there was indeed an old Heidelberg printing press dating from the 1940s, there was also other printing paraphernalia – all the letter cases of course, desk top letter presses and stone carvings. It belongs to Marko Drpić, who is a calligrapher in stone, on paper and bronze, having learnt the art in Antwerp. He is single-handedly building up a small business printing business cards and discovering for himself what the letter presses can do – calling on the expertise of old-time print workers when he can. Unfortunately, a lot of old presses were destroyed under the Communist regime as they didn’t want them to fall into the hands of individuals. The main press is used nearly every day and is still going strong. We were inspired by Marko, words and printing-related activities are very much part of my life, and Adrian has a strong hankering to try his hand at stone carving. 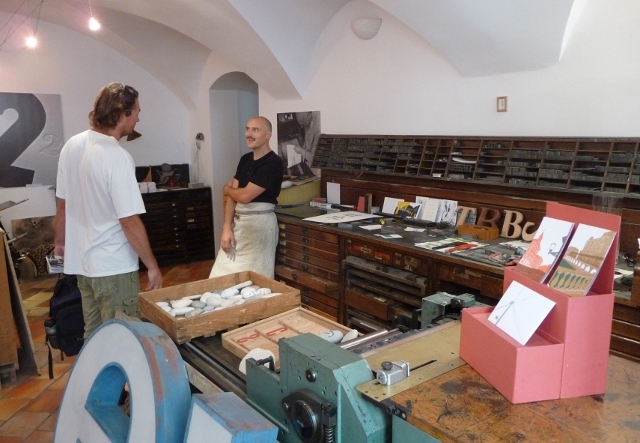 Marko sometimes runs workshops in the passageway outside his studio – another reason to be lured back to Ljubljana. We soon realised that we were running out of time to see more as we had to get the dinner underway. Should we stay another day? We rocketed back to Polje, I broke my personal best speed record (I think) and even beat the flying woman in the white blouse who’d overtaken us early on. Back at the flat, we cooked up a big spicy couscous, and later took our dessert of market-bought blueberries and raspberries, together with a bottle of wine, downtown to sit by the river where Tjaši joined us. Wine and conversation flowed as the light faded, and the Ljubljanica flowed on by too, with the occasional nutria (or coypu) swimming along past us. We were persuaded to stay another day, no surprise there! 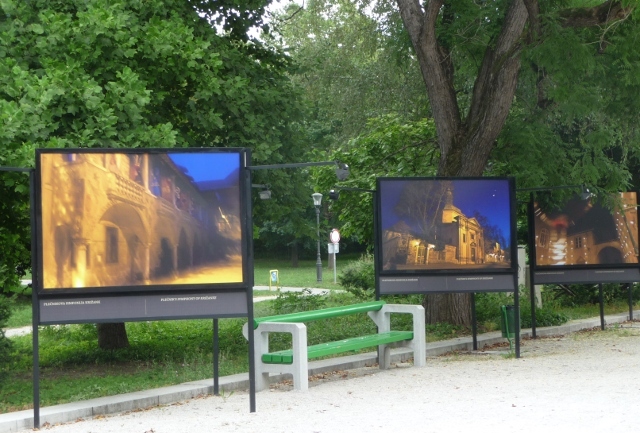 And continued our walking tour, this time on bikes – taking in the grand houses of the embassy and museum district, the art nouveau square and surrounding streets , some Baroque too with the Ursuline Church of the Holy Trinity (above), and had a run around the Tivoli Park enjoying the outdoor photo exhibition of images related to the city’s main music festival. Alenka had given us a tip about the bar at Nebotičnik. Slovene for skyscraper, this 13-storey buildng from the 1930s, was the tallest in Yugoslavia, and the ninth tallest in Europe for many years. We took the lift up to the top floor and enjoyed a drink on the outside terrace while gazing on a rather hazy and humid city, including a grandstand view of the castle, which we still didn’t get around to visit. A long morning of abundant architectural impressions was followed by lunch of a Mexican wrap from Café Romeo, perching on stools by the river. 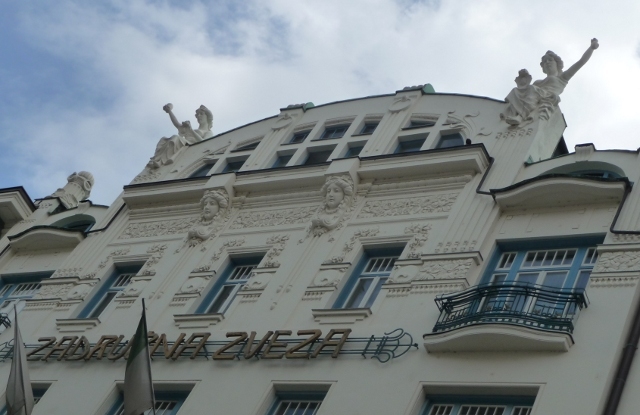 Again Ljubljana was exerting its hold on us, we were leaving it wanting more. The weather was hot and clammy and energy levels were sagging, so no museum visits this time either. We hopped on our bikes and headed to the shopping centre to find Alenka. She manages a skateboard lifestyle store and was able to get away for a coffee break. We were on cooking duty again as we wanted to take advantage of the oven to make a cottage pie – an English dish that Peter and Alenka were asking about. More food, wine, good company, and more cat bag antics from Panda. Then finally, next morning it really was time to say nasvedenje to our friends and their lovely city. This entry was posted in Art & Culture stuff, By Country - Slovenia, Food stuff, Travel stuff, Wildlife stuff. Bookmark the permalink.